What causes obesity? It is basically a medical condition that develops when a person has an excessive amount of body fat. Under Weight, Healthy Weight, Over Weight and the Obese category which is further divided into three classes. Body weight charts are helpful but most people rely on what is called the BMI (Body Mass Index) to find out which category they belong to. If you would like to calculate your own BMI we came across one that is fun and easy to use. Click here for the BMI calculator. 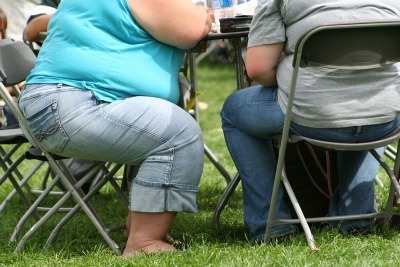 The higher a person’s BMI the greater the risk for developing obesity related health issues. The two main causes that create excess weight are poor diet and lack of exercise. But what about factors that contribute to the problem that we have very little or no control over? Things such as hypothyroidism (under active thyroid function), diabetes, hypoglycemia, the gene factory (does it run in the family) and some food allergies may also add to the problem. These types of situations are much harder to control and sadly some people may not understand that special circumstances are involved. They may only view an over weight person as being negligent with their diet and lifestyle, but as many of us know this may not be the case at all. Obesity can be a scary thing, not only because it may affect one’s self esteem but there are many health risks that may develop. Studies have shown that people who suffer from obesity are more likely to develop fatty liver disease, high blood pressure, diabetes, heart disease, stroke, kidney disease, gall bladder disease, gout along with a few others. On top of all that the AICR (American Institute for Cancer Research) say there is an increased risk of developing common cancers. Learn the difference between good sugar and bad sugar sources. Also eating and drinking healthier foods will start to do one very important thing in the human body. It will help improve liver function. We know that improved liver function is directly related to weight loss and better all around health including increased energy levels which can also help with physical motivation. Increased physical activity may be challenging at first and it is important to choose an exercise that is easy to start with, such as a simple walking program or swimming program might be suitable. It is advised to check with your doctor before starting any exercise program. It is important to get medical help and advice from a health care professional such as medical doctor and nutritionist. We all know that proper diet and exercise is the key to diminish the causes of obesity, but some of us may need additional help. Here are some other treatments that are available, usually through your doctor. Surgery such as vertical banded gastroplasty (aka stomach stapling) or gastric bypass has been known to work in extreme cases of obesity. These types of surgeries are also called bariatric surgery (which reduces the size of the stomach). This is something that must be thoroughly discussed with your doctor to see if it is the right choice for you. Others have had success with prescription drugs which would of course be prescribed by a health care professional. There are also certain types of diet plans such as Weight Watchers that have proven successful for many. But many plans can fail so the trick is not to give up until you find something that works for you. There are also treatment centers that are available such as the Mayo Clinic to help understand and solve what causes obesity. One of my favorite sayings is by Winston Churchill. I believe there is always hope if you never give up. Some of the most successful people in the world have failed repeatedly before achieving their goals. This just shows that failure can be the foundation for success.